I adapted this recipe from Gordon Ramsay's Youtube Video. It's delicious, and it needs a little effort to make this happen. 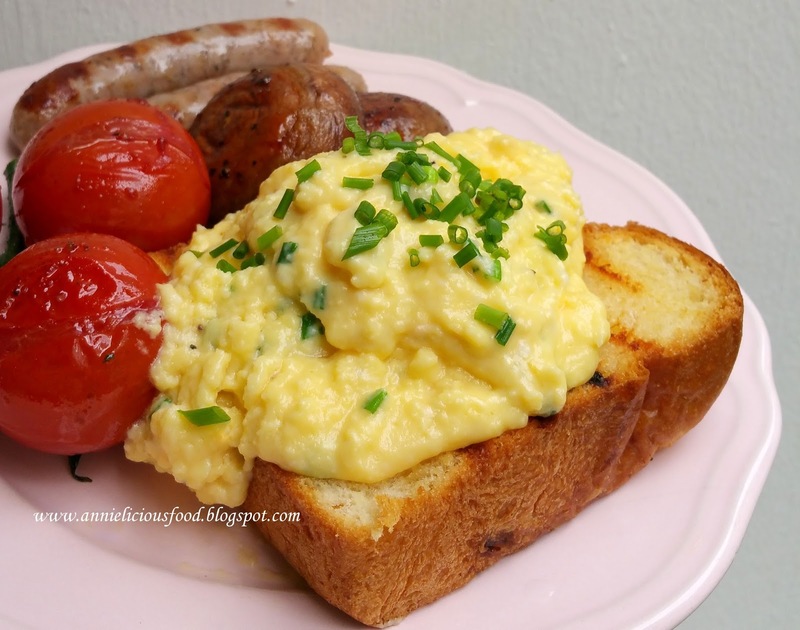 This is without doubt THE BEST recipe for perfect scrambled eggs I've ever cooked at home. The Creme Fraichè is gives them a wonderful creamy texture. Thanks to Gordon Ramsay for the recipe and tips. I think I will just stick to this. I love having brunch at home. But we have very little opportunity tho. So, weekend brunches might end up in a cafe or local hawker fare or something. 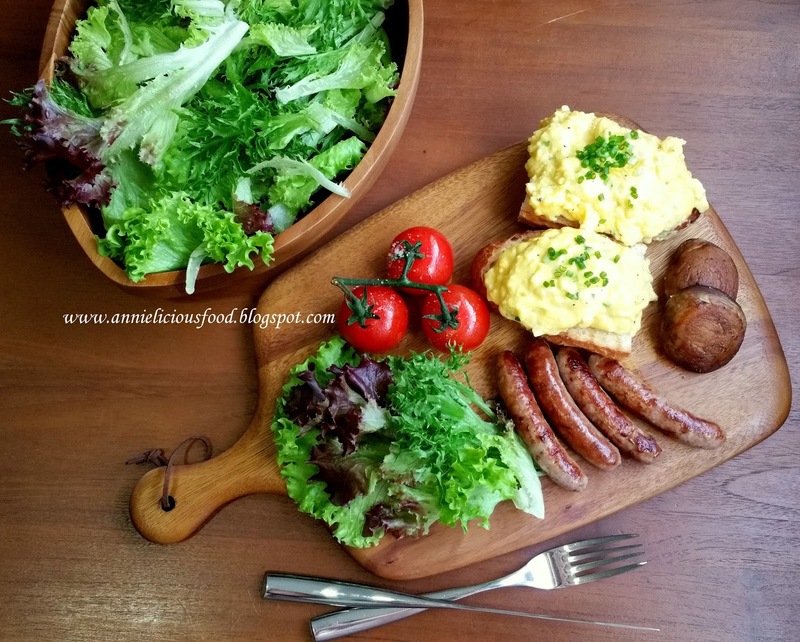 Not all cafes make good scrambled eggs. I make mine really simple. 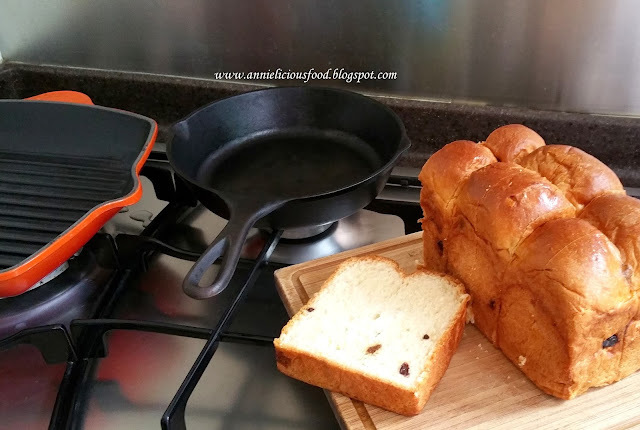 I get a store-bought brioche, slice it thickly, apply a layer of good french butter and give it a grill. This Le Creuset Cast Iron Square Skillet Grill (20cm) Classic (Flame) is a gift from Alan. I'm lovin' it every single time when I'm using it. It fits 4 slices of thick brioche nicely. Of course, you could use some good store-bought sourdough, slice it generously and pop it into the toaster. Meanwhile, in another cast iron skillet, I'm roasting my button mushrooms and tomatoes with vine on. Just a drizzle of olive oil, season with salt and pepper. Just let the mushrooms and tomatoes sit in the pan on medium low heat and it will cook well on its own. 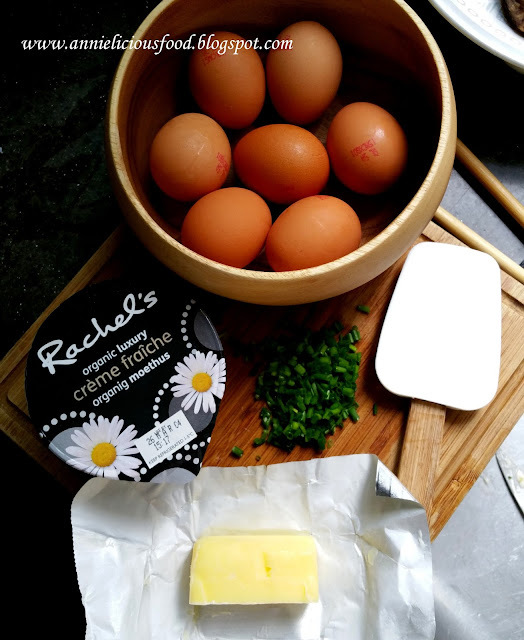 Fresh large eggs, Creme Fraichè, chopped chives, butter, salt and pepper. That's all you need. This recipe serves 2 greedy adults. This will make you feel full for hours. and any other stuffs that you think it will make your brunch looked sexier. Medium low heat fire, break eggs into a non-stick pan. Use spatula to whip in quick motion to break the yolks. Don't season it now, otherwise the egg will starts to turn watery. Add the cubed butter into the pan, continue to whip in quick motion to induce air into the egg to achieve fluffier eggs. Still on medium low heat, continue to stir and whip until the eggs start to cook. Remove from heat, continue stirring the eggs for about 20 seconds, and return to heat again. Continue this motion until the eggs clumps, but soft. Remove from heat and add in Creme Fraichè. Return to heat, stirring in Creme Fraichè. Season with freshly ground black pepper, gently salt it, and garnish with a sprinkling of chopped chives. Give it a stir to combine everything and serve with toast. It's important to add butter right at the beginning because it will give the scrambled eggs a very nice velvety finish. The general rule of cooking a successful scrambled eggs is take it off the heat, go back to the heat, take it off the heat, go back to the heat, and it repeats. And treat it like a risotto. You can't stop stirring. Always use a non-stick pan with a wooden spatula or a good silicone spatula designed to withstand heat for best results and easy cleaning. But of course, you could use ordinary stainless steel saucepot. The eggs should have the texture of soft curds. It's best not to cook for more than 3 portions in one go as you will overcrowd the pan and the eggs wont cook as good. For larger numbers, cook in two pans rather than one. 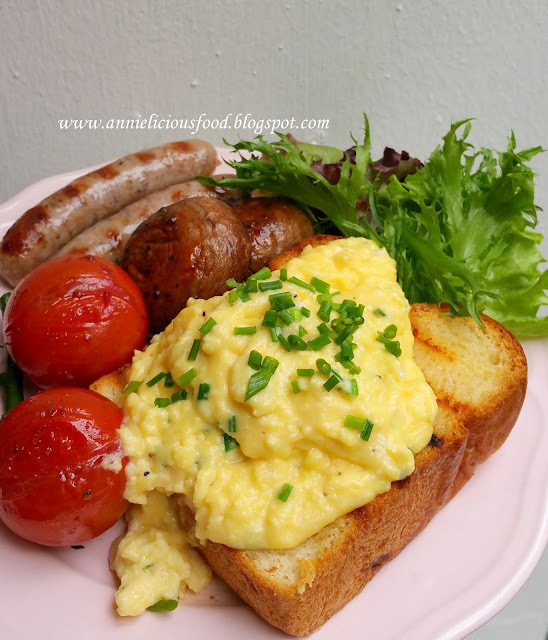 Wake up your loved ones with this amazing scrambled eggs on toast. It's easy and absolutely delicious! Since the beginning of 2016, I've been thinking about making a difference. My mind constantly churning ideas and scribbled down various possibilities. I wanted something real, nutritional and homemade food that benefits everyone. And here I am, worked very hard, I gathered lots of infos and started developing my own Collagen Bone Broth formula. Thanks to the challenges in life that pushes me to the limit and that makes me turn challenges into ideas and opportunities. 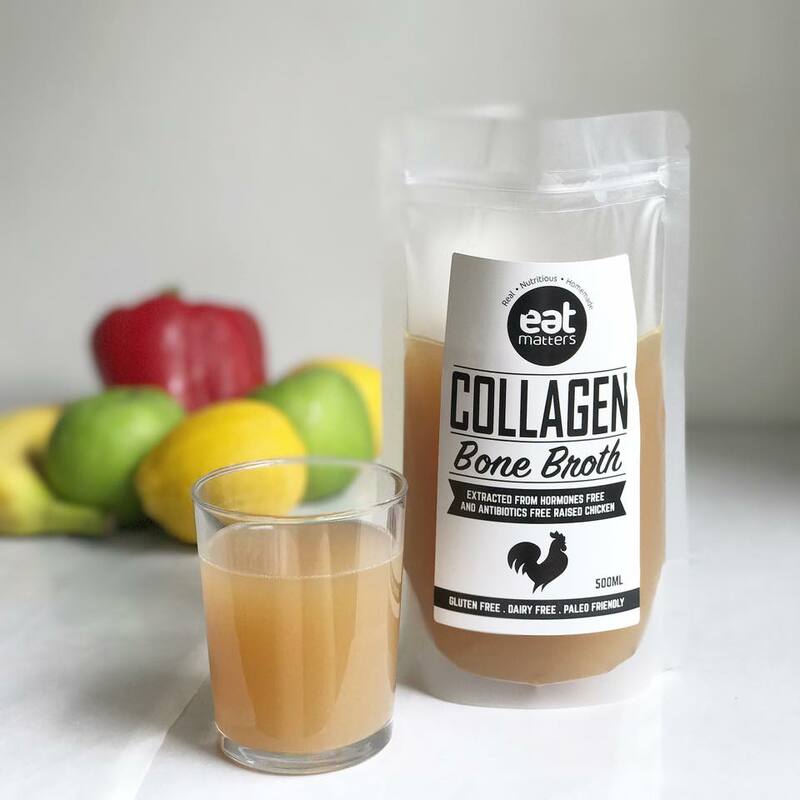 On the 7th June 2017, I've finally launched Collagen Bone Broth (By Eat Matters). 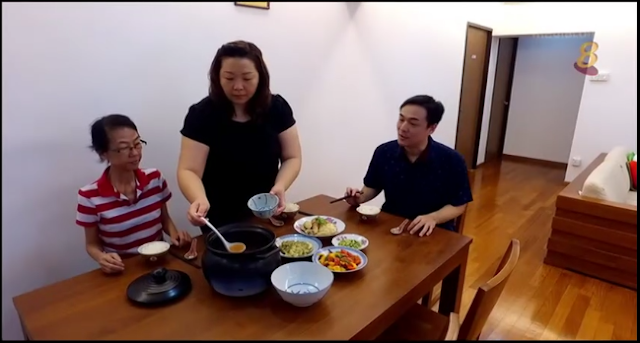 The idea of developing Bone Broth for Singapore is because I've seen lots of busy working moms have very little time to whip up nutritious food for their family. And we all have to face it that there's no short cut to Bone Broth brewing. I thought, maybe I could provide a convenience to everyone by brewing Bone Broth and get it packed individually. Save time, save energy, and it is real stuff guaranteed! Collagen Bone Broth is nutrition-packed immune booster. It strengthen gut health, anti-inflammation, promotes skin and joints healing and increase metabolism. According to TheTruthAboutCancer.Com, the collagen and the amino acids proline, glutamine, and arginine in traditionally-made bone broths help seal these openings in the gut lining and promote gut integrity. Dr.Axe too, emphasise alot on the healing power of bone broth. You may google 'Bone Broth Benefits', or visit BHG to understand everything you need to know about Bone Broth. According to many nutritionist, Bone Broth can be used to heal the body and it it is now considered a superfood. This 'new born' wasn't smooth sailing. The process development is tougher than I'd imagined. 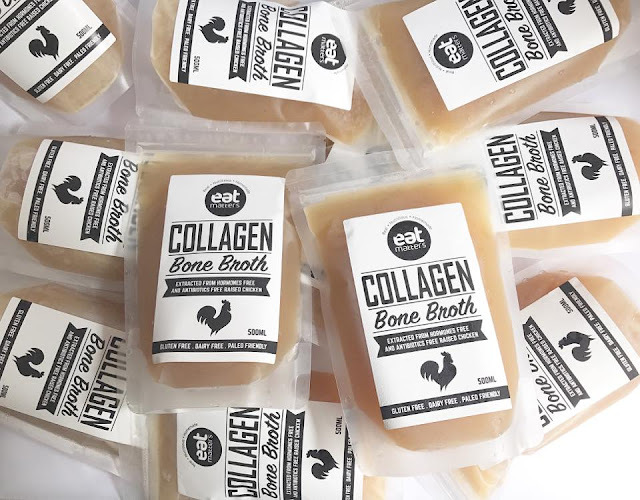 The Collagen Bone Broth formula takes almost a year's time to get there. And Eat Matters logo and packaging were then created. As we wanted the best for our product, heavy cost factor goes into our persistence of using fresh hormones free and antibiotics free raised chicken, and we also demand for freshly slaughtered from my source. It is then simmered to perfection for 16 hours for optimum extraction of real collagen, minerals and amino acids. Every batch of Collagen Bone Broth was made in small batch to ensure freshness, and it is brewed in artisanal way. No preservatives, no additives, no salt, no sugar, no nonsense. The painstaking process begins from picking the finest raw ingredients, preparing, brewing, constant checking, straining, skimming, final QC on taste, texture and ensure each batch are at the right thickness in collagen level. When bone broth passes QC check, it is then cooled to its right temperature and it will be then be packed, sealed and send for quick freezing. There isn't any short cut way, and every details is no joke. Bone Broth is definitely a new thing in Asia. But the renewed interest in broth is heartening because it is an excellent nourishment for body and mind. Not surprisingly, diverse cultures from across the world have had their own versions of bone broth. For example, Japanese Tonkotsu ramen is also bone broth! And hey! 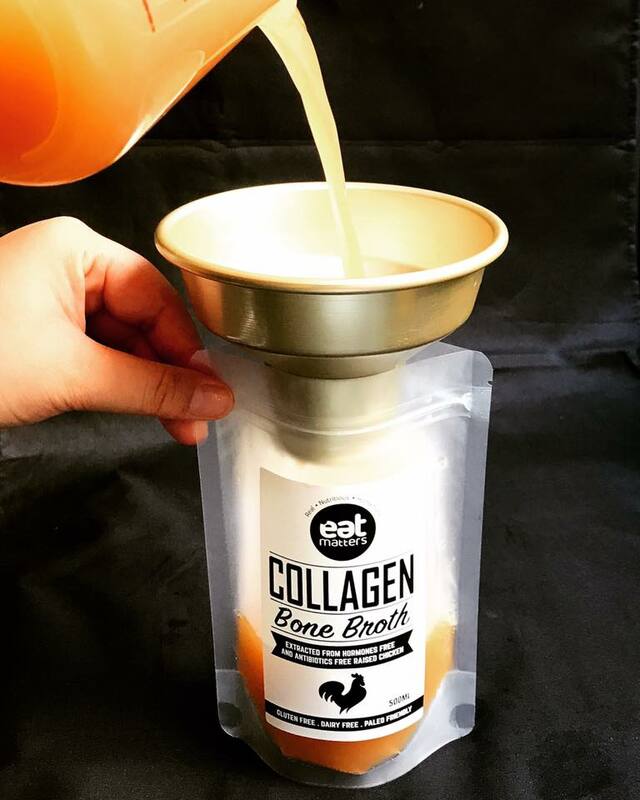 We have our version of Collagen Bone Broth in Singapore! Collagen Bone Broth can be gently reheated and consume on it's own, or it can be used to whip up some delicious dishes. Porridge for young kids, a hearty nutritious bowl of soup, stews, or a bowl of tummy warming noodle soup. Everything is possible! As of now, we are supplying to Singapore friends only. For those who followed my Facebook Page, I believe everyone knows my recent stint on the latest TV Show (Channel 8) Touch-Screen Cuisine (弹指间的料理). 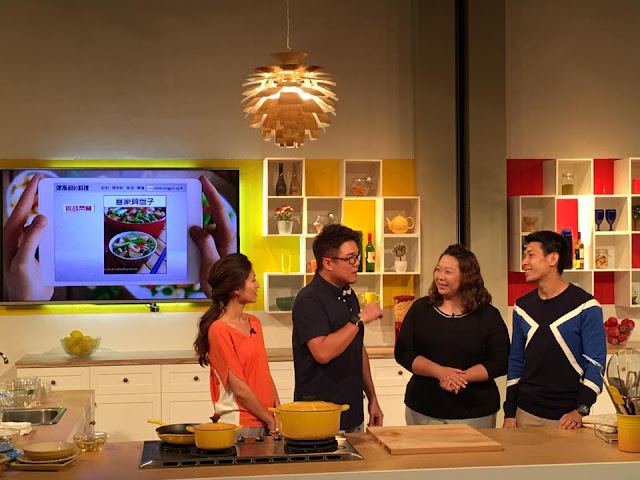 I have to thank MediaCorp for the approach for such exciting opportunity of being involved in the production of this new Mandarin TV variety cooking program. Hosted by Ben Yeo and Vivian Lai, Touch-Screen Cuisine (弹指间的料理), is the production of MediaCorp Channel 8. 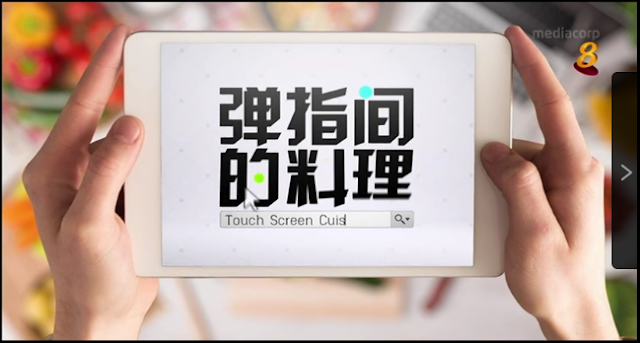 Touch-Screen Cuisine appears once every Wednesday at 8pm, and was just 30 minutes long, showcasing blogger's popular recipes from his/her blog. This entertaining programme that turns selected online recipes into mouth-watering reality. Each episode introduces some of the food bloggers famous recipe and features and artiste trying it out. Other than Annielicious Food (myself), many well known Singapore bloggers were involved featuring their signature dishes too. 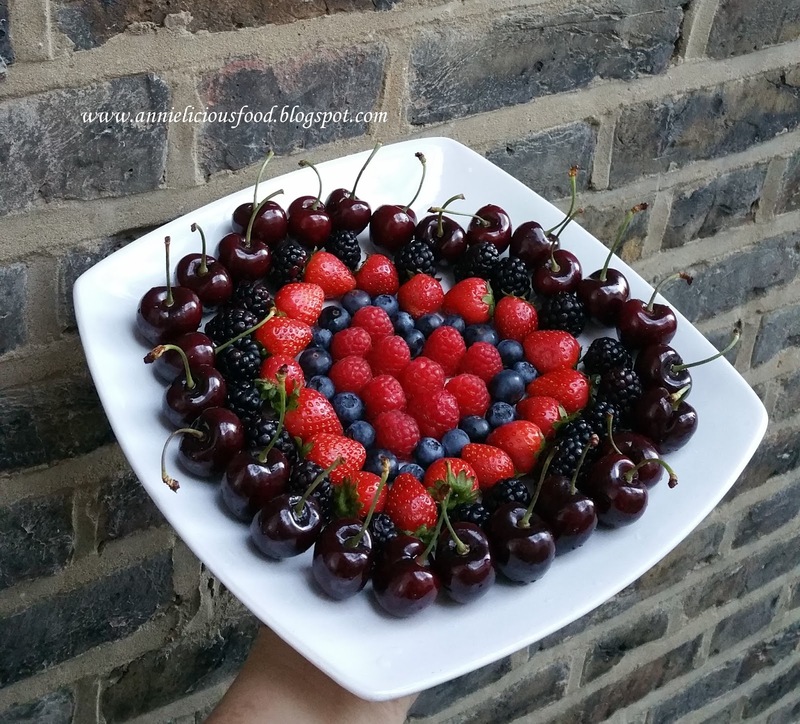 That includes Travelling-Foodies, Peng's Kitchen, Delishar, Chef and Sommelier, The Domestic Goddess Wannabe, GuaiShuShu, Bake For Happy Kids, I eat I shoot I post, Little Miss Bento, Victoria Bakes, Chubby Hubby and who else? I forgot if I missed out any. I hope I didn't. Bloggers were expected to prepare their signature dishes being cooked and prepared on the spot. When I was approached on this task, I was reluctant. I have messy and tiny kitchen, I have very little time, I wasn't ready for that, I don't know what to do, I probably will feels too stressed over it and the list goes on. Lots of uncertainty, lots of imaginations, lots of thoughts. It's like... there's butterflies in my stomach kind. 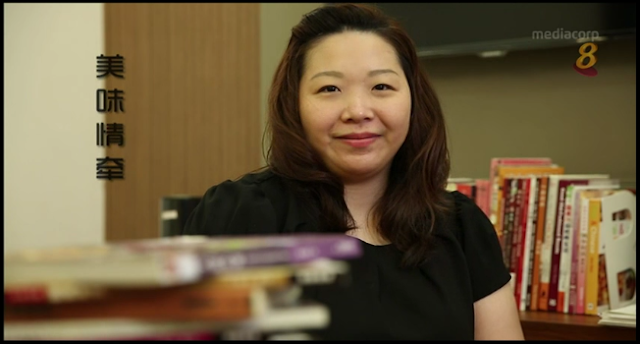 The entire discussion process with MediaCorp wasn't smooth sailing. 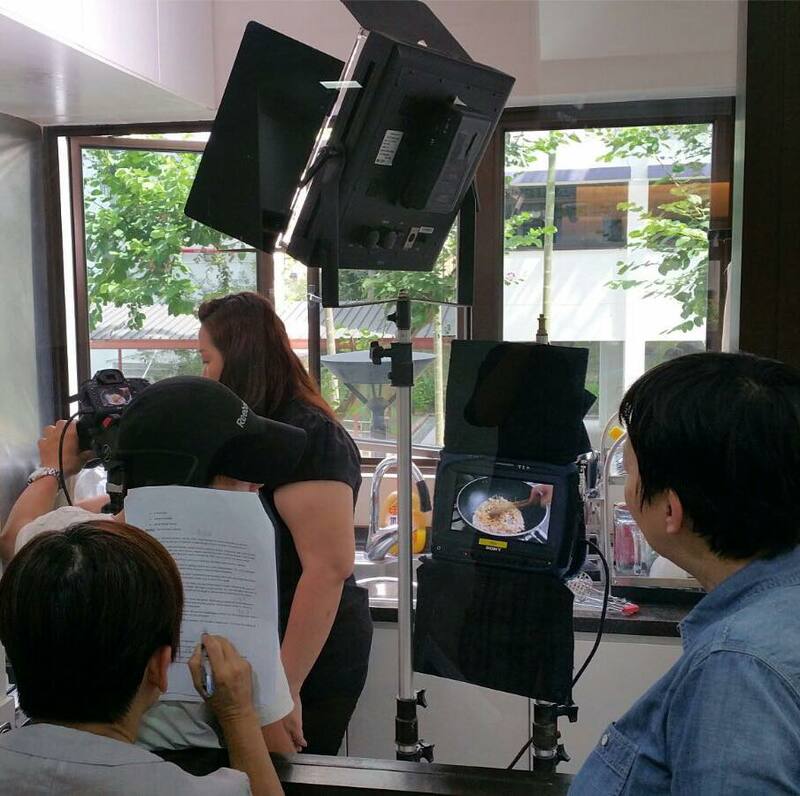 Finalising the dish takes forever due to some coordination needed at MediaCorp's side. I proposed Singapore Chilli Crab at one point of time, but due to Dr. Leslie Tay ( I eat I shoot I post ) is cooking Black Pepper Crab, this idea was dropped. And some Hakka cuisines were mentioned, but it wasn't come to a conclusion. In the end, Hakka Abacus Beads (客家算盘子) were decided, considering me growing up from Hakka Family, I do cook Hakka dishes more at home, and my Hakka Abacus Beads recipe on my blog is very well received. The production of the program was divided into 2 parts. MediaCorp did a portfolio shooting at my home back in April'16. I was really busy with my work back then, and I'm the lucky ones that I have helper at home. I have to really thank my helper for helping me to get my house cleaned up before the shooting. I have to re-create the Hakka Abacus Beads during the home-shooting session just for that very short introduction. Other than that, I have to prepare a table of meals for profile shooting. I've got charcoal fire long hour brewed soup, hakka salted chicken with ginger sauce, stir-fry vegetables, and the simplest yet delicious french bean omelette was our all time favorite. As part of the shoot, my mother in law and my husband have to sit down for the meal with me. The whole shooting process in the studio was tiring. 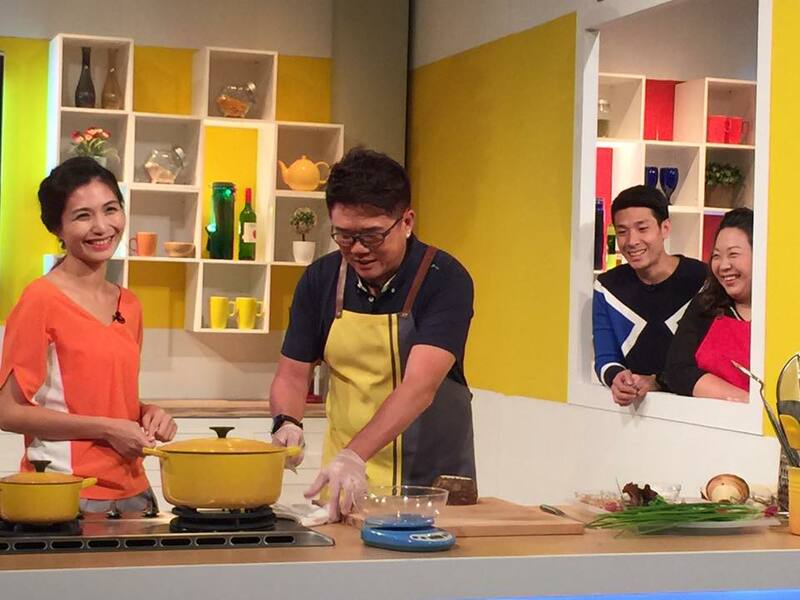 Also, guest artiste for the week that I'm cooking with, is Calvin Soh 苏志成 who is an experienced cook. He hosted many cooking show and he himself is a Hakka, originated from Malaysia who is experienced in Hakka Abacus Beads before. This dish is easy task for him. Infact, Ben and Vivian says it right. He's here to PK with me. Haha. He's funny! The first one was, why is there's 菜圃 (cai po/cai pu), a.k.a preserved white radish appeared on this dish. The second one was, there's no minced pork in the dish. The third one was, Calvin Soh insisted to add Fish Sauce in this dish, while I didn't. Oh well.... Keep the traditions is the idea that MediaCorp initiated. Well, minced pork wasn't used during good old times. But pork were added at the latter as I was told. The existence of cai pu 菜圃 is supposed to give flavor to the dish since there's lack of pork. And for the fish sauce, there's no fish sauce were used during old times. Dried shrimps and dried cuttlefish is the element of the Umami taste of this dish. Not fish sauce. So, I choose not to add fish sauce in there for this recipe to retain it's originality. But again, there's no right or wrong here. Sometimes I do add fish sauce for taste enhancement too. After the whole episode of Touch-Screen Cuisine Challenge, I've learnt something. It's about how one should balance between holding the tradition flavor vs pleasing modern generation's taste-bud. And requirement vs expectation. Yeah. More to learn. 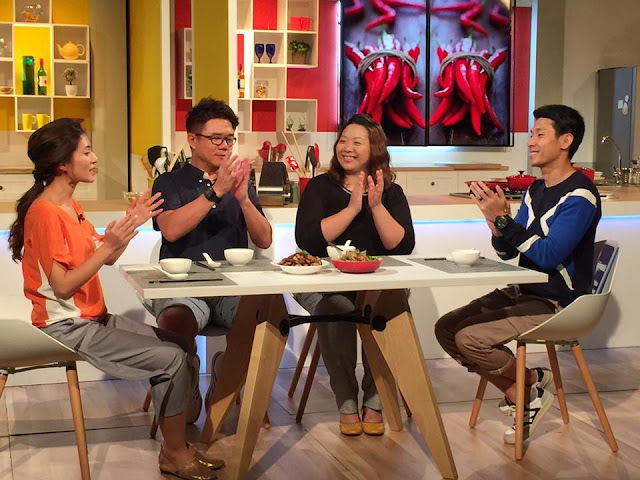 For those who's residing in Singapore, you can catch up this show on Toggle TV to watch my episode online 弹指间的料理 Touch-Screen Cuisine (Episode 11), and as well as other episodes featuring other recipe bloggers too. If you wished to try making this dish for your family, here's the recipe : Hakka Abacus Beads (客家算盘子). A whopper of a deep dark chocolate cookie packed with chock full of chocolate chips. There's no reason to resist eating this cookies. Absolutely delicious, and by far the best cookie recipe I've ever used! There's nothing short of SENSATIONAL!!! The glass of milk is not just a prop. It is a necessity for this. A bite of chocolate chips cookies and a sip of milk? I'm totally on board. It's just heavenly! These are the chocolatiest cookies I'd ever come across. I adapted this recipe from Nigella Lawson, but tweaked abit. It makes 12 big cookies or make it 14 if you want your cookies to be slightly smaller. I urge you to make full recipe. Because this is so good, I guarantee you, it won't keep long. But if you are only feeding 2 to 3, you can bake half the dough and freeze the other half. Just form the cookies dough into balls, freeze the cookies balls on a little tray. Once they're hard, just bung them in a freezer bag, seal, and stash it back in the freezer. You could bake them unthawed at a later date. Using good chocolate is important. The logic is simple. If you use good chocolate, you will get good quality chocolate cookies. This is what I call an investment. And it's worth it. I used Hershey's brand chocolate chips and chocolate powder for this. Preheat the oven to 170°C, fan ON. Melt the 125g dark chocolate in a heatproof dish over a pan of simmering water. Set aside to cool. Put the flour, cocoa, bicarbonate soda, baking powder and salt into a bowl. Cream the butter, fine sugar and brown sugar in another bowl. Add the melted chocolate and mix together. Beat in the vanilla extract and cold egg, and then mix in the dry ingredients. Finally, stir in the chocolate chips, mix well. Put the shaped cookies dough into the fridge and refrigerate it for 20 mins. Cut the dough into equal piece, remove the cling wrap layer and shape the cookie dough. (Refer pics below) Place shaped cookie dough on a lined baking sheet about 6cm apart. Do not flatten them. Cook the cookie dough for 18 to 19 minutes, testing with a cake tester to make sure it comes out semi-clean and not wet with cake batter. If you pierce a chocolate chip, try again. Leave to cool slightly on the baking sheet for 4 to 5 mins, then, transfer them to a cooling rack to harden as they cool. The secret of this recipe is simplicity and good quality ingredients. Do bear in mind. Step 5 - Mix wet and dry ingredients together, and stir in the chocolate chips. Look at the sinful mess! Step 6 - Divide the cookies dough into two portion. Wrap them with cling wrap, and shape them. Step 8 - Cut the dough into equal piece, remove the cling wrap layer and shape the cookie dough. No mess! Place shaped cookie dough on a lined baking sheet about 6cm apart. Do not flatten them. You cannot go wrong with this recipe. They are so easy and absolutely delicious! Max requested me to bake 30 pcs for him to bring to work next time. Do I have to say more? It look and taste nothing short of perfection. This is definitely a MUST TRY recipe. 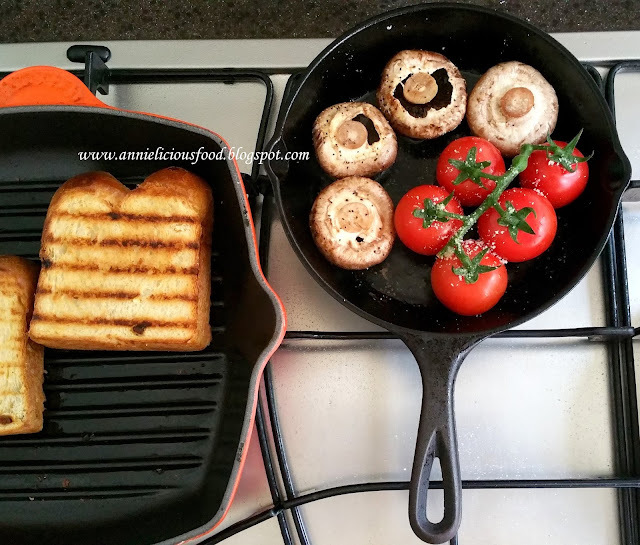 Annie's Cooking Xperience - Something Exciting is on the way! Yep! Something exciting is on the way. 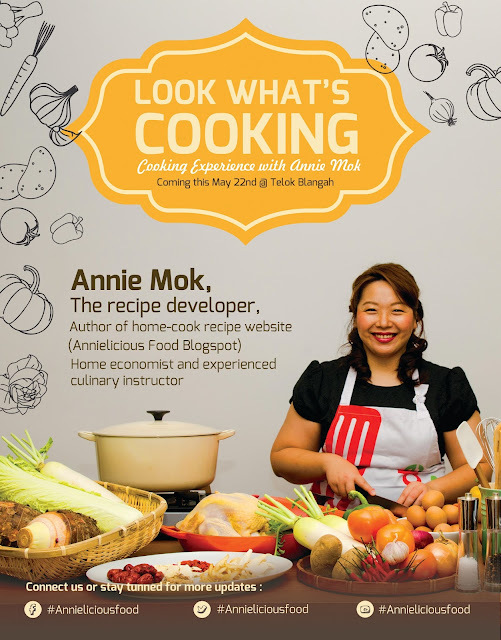 After procrastinating for so long and I get bugged by fellow readers and friends for so long, I finally convinced myself to host Annie's Cooking Xperience this coming May 2016. I always wanted to share. I wants to share with fellow young ladies on how to select the right ingredients, how to fillet a fish, how to chop a chicken just like your mom do, how easy home-cooking it could be. I hope this cooking workshop could encourage more women to start cooking at home and bring good food on the table. Food gathers people, food creates family harmony. Meanwhile, I'm fine-tuning some details and drafting recipes. Do stay tuned for more updates! 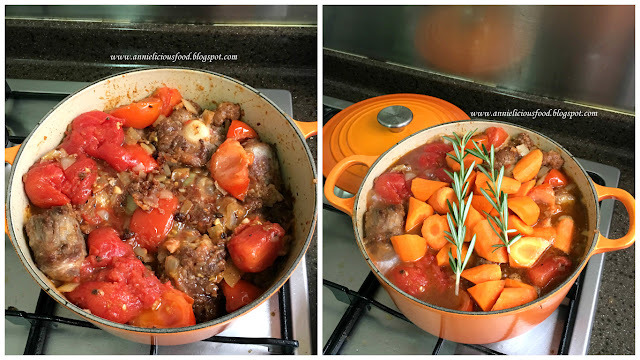 Fresh and meaty oxtail, red wine, rosemary, garlic, onions, tomatoes. By reading the list of ingredients, you know this makes a great french stew. This slow-cooked oxtail meat is so soft and melting, and drenched with rich red wine sauce. This insanely delicious comforting food is absolutely perfect for parties and family gathering! Be it Red Wine Oxtail Stew or Oxtail Bourguignon, or French oxtail stew, they are technically the same, although some could argue that they are different. Each family has different style of cooking Oxtail Stews. List of ingredients may vary. Some prefers more spices, some prefers basic flavors. French braise them with red wine and mushrooms, and it can be beef or oxtail or veal. There's no lack of Oxtail Stew recipes online. But mine has shorter list of ingredients tho. So, it's easier to achieve. Everything is available in Cold Storage. But it does not means that this stew is effortless. Mashed potatoes would make the perfect side dish to complement oxtail stew. Although oxtail is regard as cheap cuts in some country, but in Singapore? No. Not really. Oxtail is expensive in Singapore. In some restaurants in other countries who serves this dish in a peasant way, especially French, and slowly going into haute cuisine. But not yet there, and we're not sure if they will be there or not, unlike Beef Bourguignon. 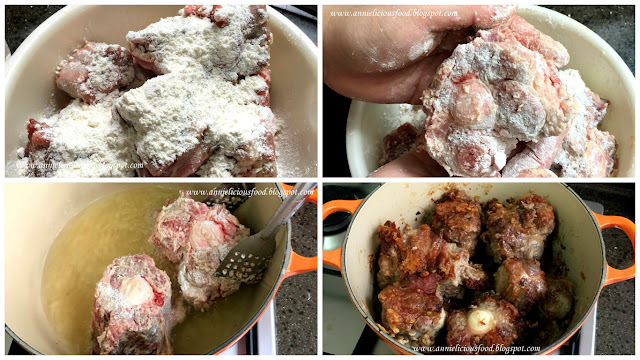 Coat oxtails with 3 tbsp of plain flour evenly. 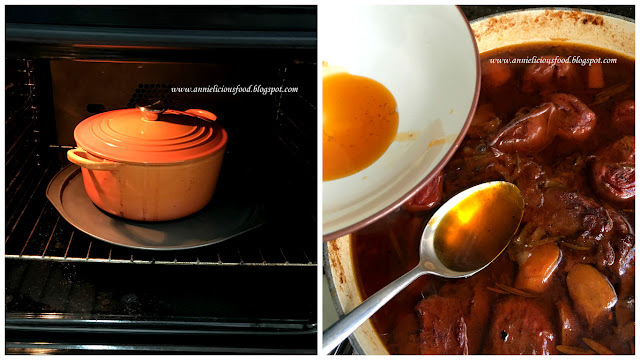 In a french pot, heat up 4 tbsp oil, and give oxtail a nice sear until brown on every side. Remove oxtail and set aside. Throw in chopped onions, and garlic into the same pot. Saute until onions are soft. Add in fresh tomato wedges and whole peeled tomato can. Fry for another few minutes until tomatoes slightly softened. Add in browned oxtails, arrange them nicely on the pot, ensuring each piece is at the bottom, while the tomatoes is on top. Add in carrots, rosemary, red wine, beef stock, spanish chorizo and ground black pepper. Let it simmer on the stove for 30mins, and transfer the pot into a baking tray, and send the pot into pre-heat the oven to 170 Degree Celsius for 1.5 hours. Do check for splatters and spillage. Reduce to 160 Degree Celsius if there's a need. Leave oxtail stew aside and let it age for a night. Remember to reheat it before going to sleep. On the next day morning, add salt, reheat the stew pot and let it simmer for another 30mins or upto 1 hour. Scoop away the top layer of fats. Add in tomato ketchup and give it a stir before taste test. Adjust saltiness accordingly, and the stew is ready to eat. Here's the complete pictorial guide for your easy reference. I'm sure this series of pictorial guide could complement the method in writing and so as to achieve better understanding. Step 1 : Dust oxtail with flour and pan-sear it till brown color. This gives really good flavors to the oxtail stew. Step 2 : Be very sure that you do not wash the pot after searing the oxtail. We need those brown patchy mess! Just throw in onions, garlic, tomatoes, and give it a good stir fry. 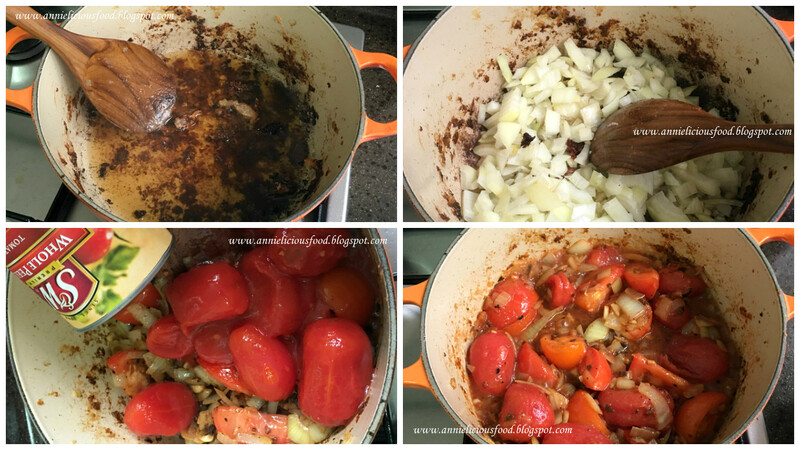 Before you even start cooking, do select the right flameproof casserole french pot size for your dish. The pot size should be able to fit all oxtails in just nicely with little leeway for other ingredients to fall down to the bottom of the pot except liquids. Like this, you don't have to tie kitchen string around each oxtail piece to hold the meat on the bone which I find it extremely tedious. Step 3 and 4 : Add in oxtails, ensuring oxtails are at the bottom. And then, add the rest of the ingredients except salt. Max bought me some real good Spanish Chorizo from Spain sometimes ago. 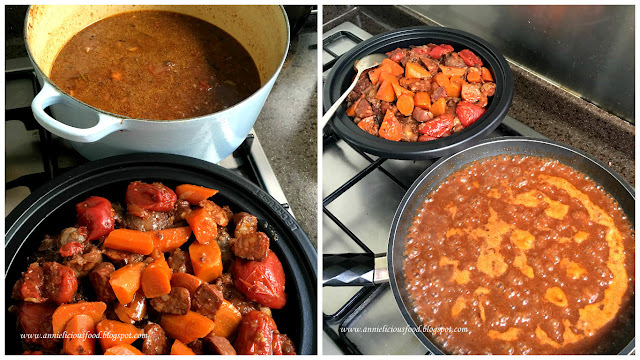 I added Spanish Chorizo into the stew. Why? Because Spanish Chorizo has its distinctive smokiness and deep red color from dried smoked red peppers. It gives really nice flavor to the stew. You may argue that this isn't French stuff. It's optional. You don't have to follow exactly the same. No strict rules here. You also may add some paprika for extra heat if you prefer. I'm quite regretful for using 22cm french pot for this dish. When I send the pot into the oven, it splatters and spills. So, I transfer to a 24cm french pot after that. So, selecting the right pot size before you cook is really important. Leaving oxtail stew to age overnight is the key to success. The flavors will infuse all over during aging process. 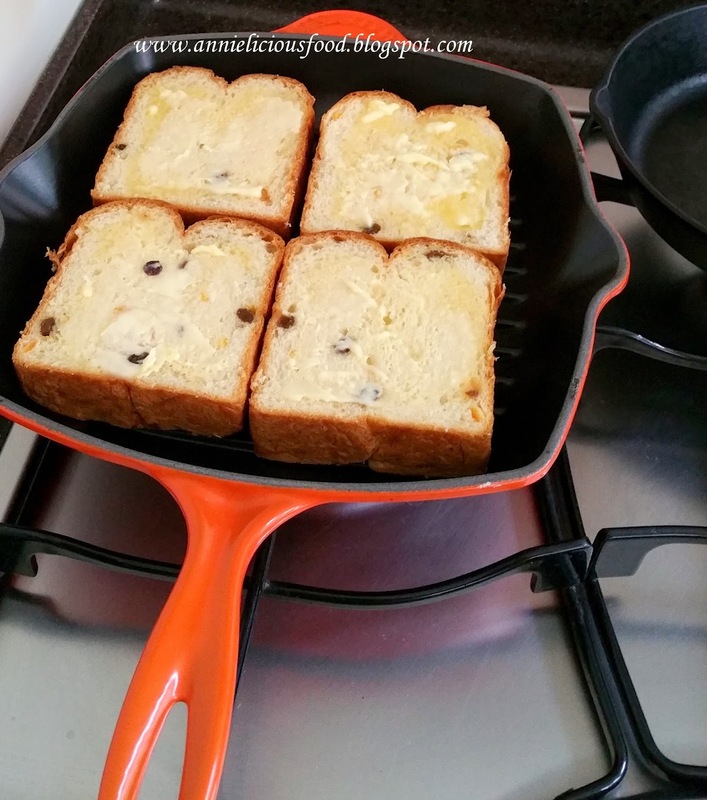 And Le Creuset french pot hold heat amazingly. It still 'cooks' during the cooling down process. Step 8 : This stew will gives you a thick layer of fats floating on top. Don't get freaked out. Don't remove those fats on the first day. 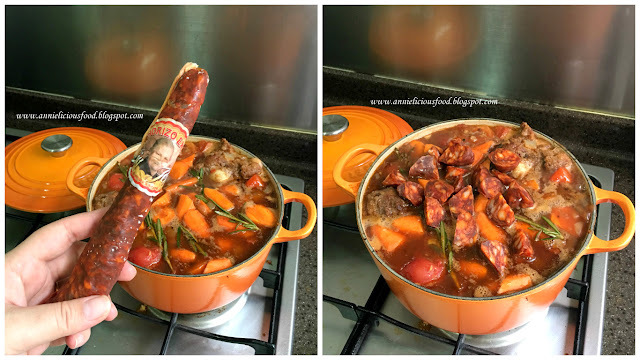 Because fat layer on top prevents air going into the stew, and this also explains the stew keeps well overnight without keeping it in the fridge. Fats will only be removed on the day you consume the stew. This dish can be done in a rustic way. It can stop at step 8, or boil a little longer if one wish. Or like me, you may proceed to put in extra effort to go to step 9. This also means you have to wash extra pot, sieve, and utensils. Step 9 : Stew juices needs to be strained, and reduced under flame until desired thickness has reached before pouring over the oxtail stew. You may also do another taste test after the sauce is reduced, just incase you want to do any further adjustment. Tomato ketchup would be a good compliment to the stew juice. Look at the end result. My oxtail stew will have a nice gloss with the reduced stew juices poured over. And sprinkle chopped coriander leaves over oxtail stew gives another level of attractive look. Although steamed rice is a good option as a side dish, but I assure you, Oxtail stew is best eaten with mashed potatoes as a side. My mashed potato recipe is very simple. Some Russet Potatoes, good slab of butter, some fresh milk, and season well with salt and pepper. And oh! don't forget to prepare some salad too! Cooking method for this dish requires slowly simmering the oxtail in wine, tenderizing the meat that would have been too tough to cook in any other way. Total cooking time of my Red Wine Oxtail Stew is 3 hours, not counting cooling time, and aging time. The meat fall off the bone nicely, but still remain some chew. I'm absolutely satisfied. It's insanely delicious!!! Thou this dish needs abit of patience to cook, but I assure you that this is worth every effort. Do give this dish a try. I'm sure you will love it. I love London. This beautiful city has lovely people, nice weather, and delicious food. The first trip I went London was with my husband. London city is part of our 25 days honeymoon trip. The 2nd trip, my husband went for business trip, me and my mother tagged along. 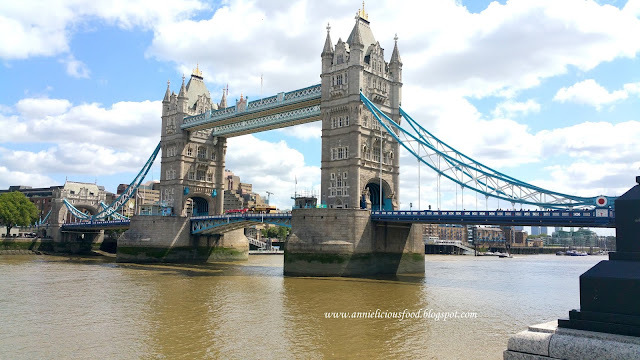 There's alot to do in London City. I'm a foodie. I love exploring good food wherever I go. 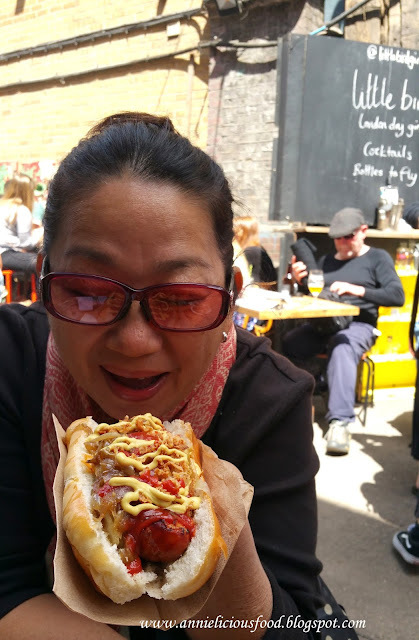 Here's my list of good food I had in London which I recommend you to try. Breakfast is everything. The beginning, the first thing. It is the mouthful that is the commitment to a new day. But this only applies to me during Holidays and Travelling. A good breakfast or brunch is very important to start my new travel day to me, and so, I eat well. 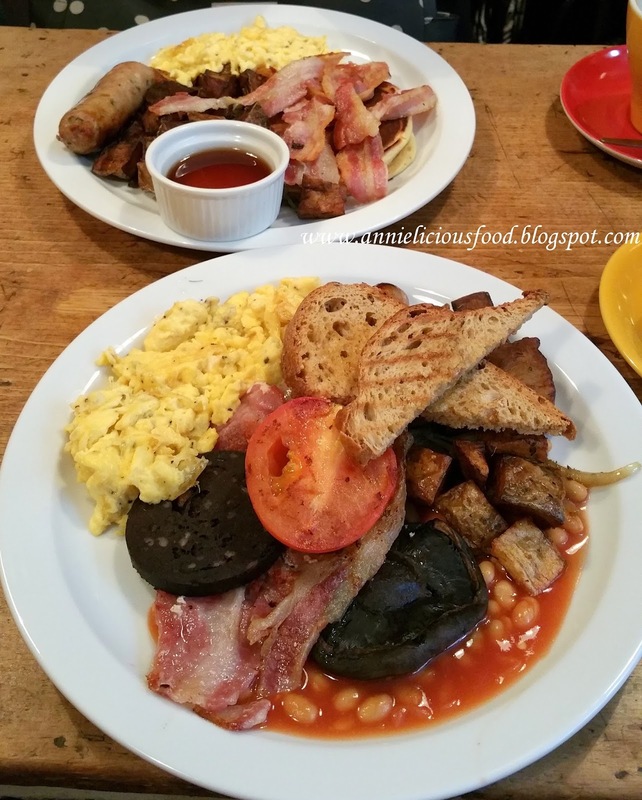 There's no lack of good brunch places in London City. But I'd recommend 3 nice Brunch places. The dishes Muriel's are inspired by the hearty cooking of mothers and grandmothers and have been developed by their chefs to create British classics with a modern twist, served in a 1950's-Style Kitchen setting. The ingredients they used are all British sourced quality ingredients delivered fresh to their Kitchen and prepared daily. I've been to The Breakfast Club twice, and I'm still lovin' it. 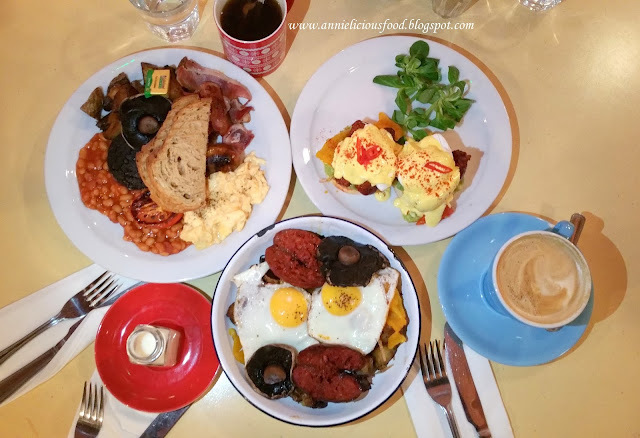 If you're looking for no frills breakfast food for brunch in London, you have to come to this place. The food is quite good, loaded with bacon fats which everyone loves. I personally like the black pudding. 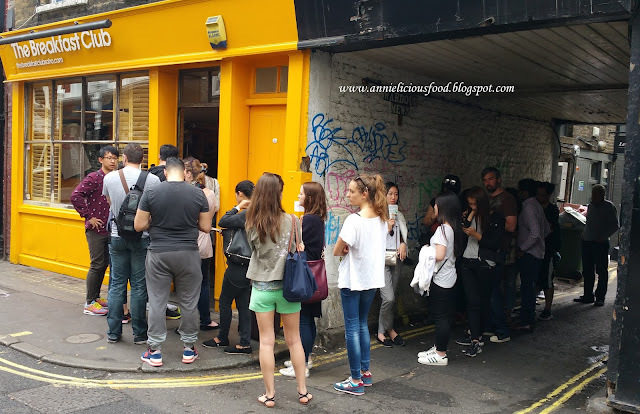 The Breakfast Club is popular in London, and so, be prepared to set out early to arrive and get ready to queue. Despite the rain, cold, and gloom, I joined the small queue to get my seat within 20mins. 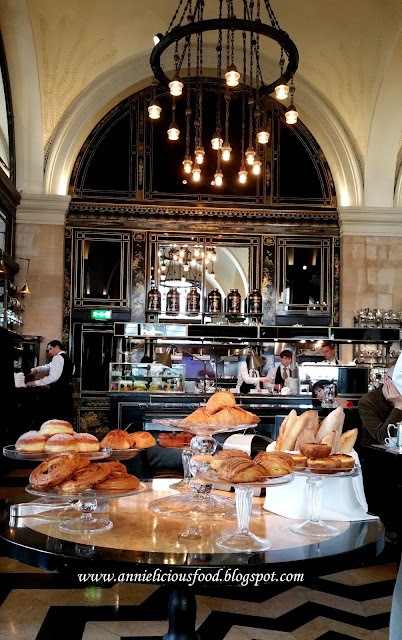 The Wolseley is a beautiful cafe-restaurant in the grand European tradition situated in the high class Piccadilly, London. Given its location, I would agree the pricing on the menu is relevant. 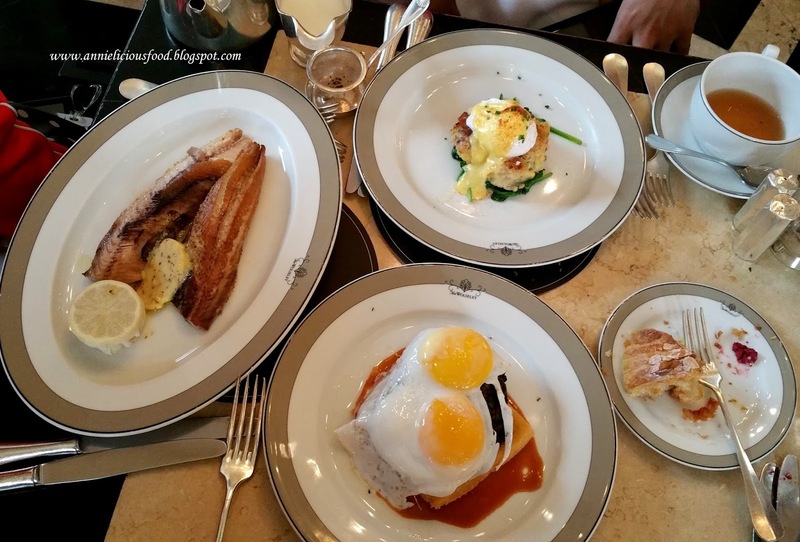 This is the restaurant that you may want to consider to go for traditional breakfast, starting at 7am on the dot from Monday to Friday, breakfast is served at The Wolseley from an extensive menu. It can be quite packed during busy times. So, reservations are highly recommended. We wanted something different. Not the ordinary or typical American Big Breakfast with scrambled eggs and sausages. So, we've picked these 3 dishes on the menu. Because Brunch is too full, and lunch can wait. So, lunch is always late during travelling days. One very memorable lunch we had during our first trip to London is the slo-mo lunch at Dinner by Heston Blumenthal, located in Mandarin Oriental Hyde Park, London. Walked into the restaurant interior has been conceived as a subtle, elegant portrait, contemporary and innovative, yet mindful of tradition. What attract me the most is the chefs working process in the see-through kitchen. Each chefs take care of individual station. Standing there watching the whole kitchen's operation process is quite enjoyable. Dining in Heston Blumenthal's restaurant, everything is about precision. I love this place. New craft butchery. Remarkable concise steak menu in an industrial-chic restaurant decorated with meat cleavers and aprons. Hip and trendy no-reservations in the middle of Soho. There's only one dish on the menu - the flat iron steak. This restaurant focus on doing one item well. I love such dining concept very much, but this is rather not popular in Singapore. Now, talk about the steak. The steak is absolutely fantastic and very tasty. At £10 for a steak, this is extremely value for money and make me wanna visit this place again. Lunching not necessarily in a restaurant. I love markets, street food, local stuffs, and seasonal stuffs. We didn't have luck on Borough Market during our 2nd trip. 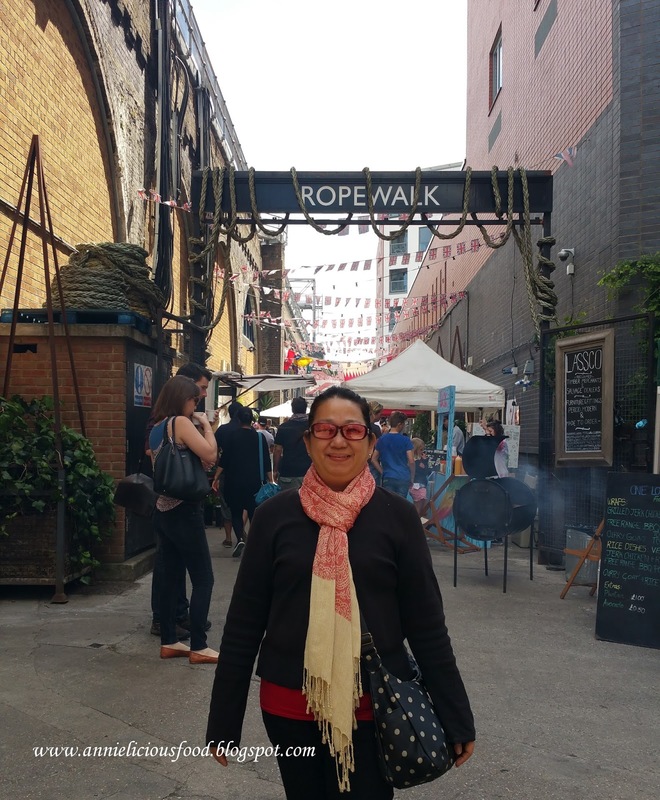 So, we proceed to Ropewalk, the lively street market running between Maltby Street and Millstream Road. 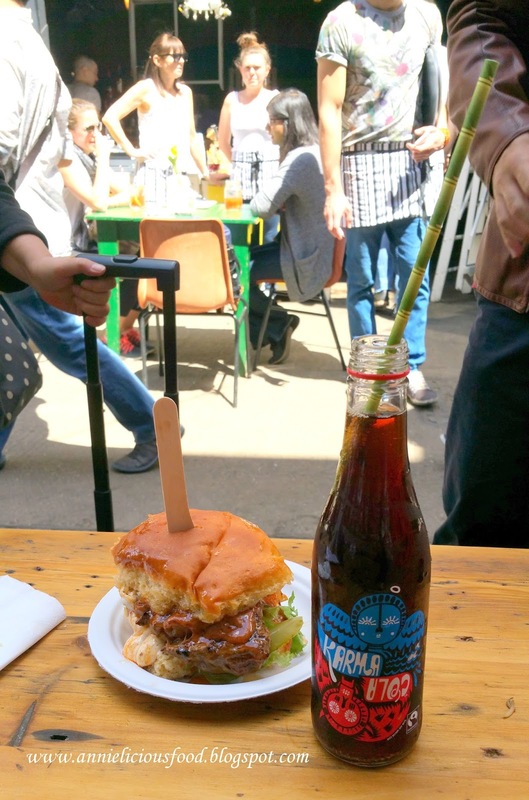 There's combination of stalls, under-arch shops, pop-up bars and eateries. Ropewalk focused on artisanal foodstuffs, baked goods, fresh meats and vegetables. Food offerings at Ropewalk include seafood, grilled meat, sandwiches, pastries, scotch eggs, BBQ goodness and alot more! We had some really nice steak burgers, and german wurst buns. I'm still salivating while I'm writing this. Ropewalk closes on Sunday, Monday, and Tuesday. Do check out the operating hours before heading over to avoid disappointment. People always neglected the beauty of spending time picnic in London. I don't know why. London is really not just sight seeing and shopping. 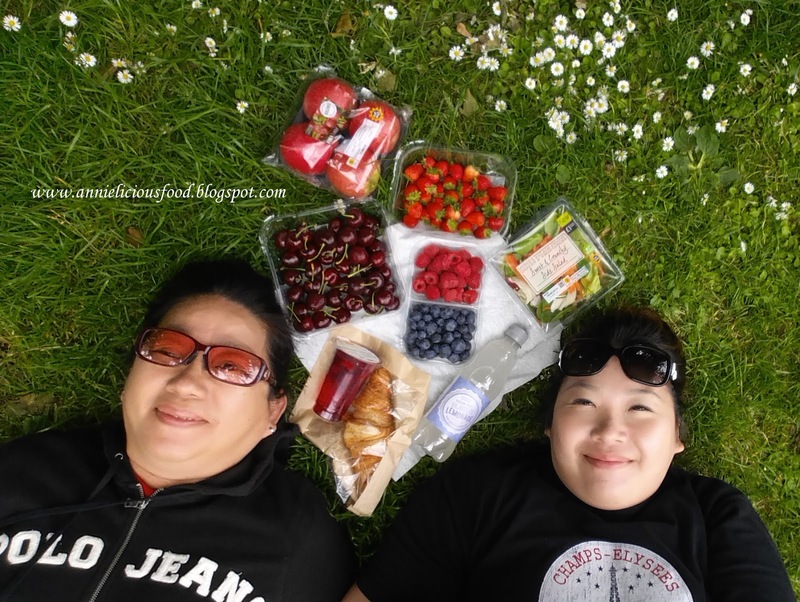 Picnic in London is a must. Cooling nice weather, beautiful park, lovely squirrels. Who doesn't love? 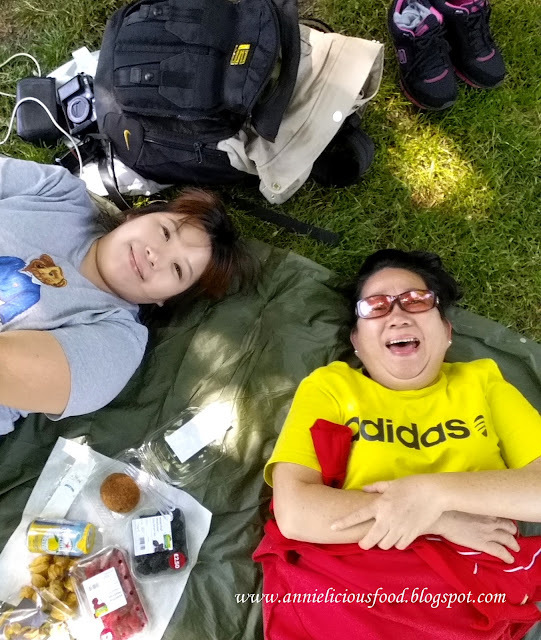 We slow down our foot path, bought some fruits and snacks and go for nice picnic. Picnic is about eating also, but in a more relaxed way. We went to Kensington Gardens after our Fish and Chips lunch at The Fish House at Nottinghill. It's just 10mins walk away, and we will be able to reach Kensington Gardens entrance. We love this park. Simple, clean, and friendly squirrels. We spent great time here. Do you know why this squirrel is so friendly with us? We fed em' peanuts taken from our SQ flight. There's a big round pond in the middle of Kensington Garden. We feed the birds. And duckies.... with Hup Seng Crackers! Hahahaha!!! They love it! Hyde Park is huge. If you wanted to go there for Picnic, be sure that you plan properly which part of Hyde Park you wanna go. Before we go Hyde Park, we went Supermarket to get some fruits, salad, croissant, drinks and jellies. We love it this way. Harrods marketplace is a very nice place to source for Picnic food. Go straight for their Duck Eggs Scotch Eggs. It's nice. And not to forget that wide selections of bakes and makes. It seems like Burger and Lobster is really popular and people are raving about it. I don't know why. This restaurant is worth a visit when you are in London. 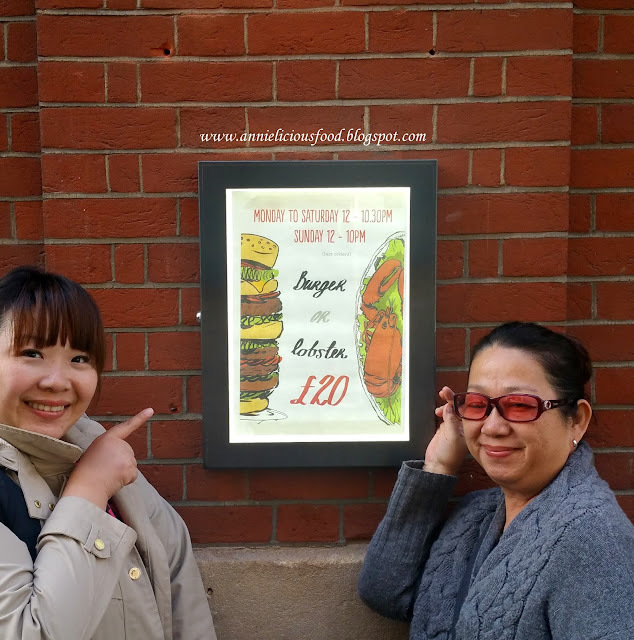 One of the most memorable meals that I had during my London trip was Burger and Lobster. Table is always full, and if you refused to wait for your meal, do go there super early. 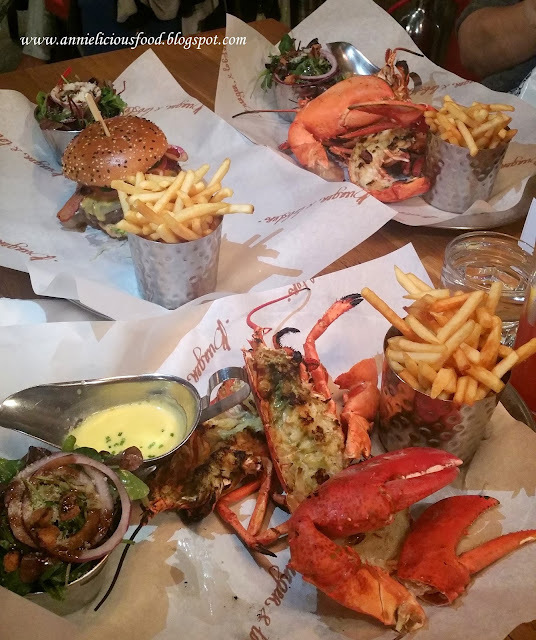 The concept of Burger and Lobster is is simple and yet brilliant. There's no menu in the house. Because they only offer three items - Burger, Lobster, and Lobster Roll - and at £20 each. A whole fresh lobster grilled to perfection, a generous bowl of lemon butter dip, and served with a side salad and a bucket of fries..... all for only £20. We ordered 2 sets of Lobster, and 1 set of Burger. Conclusion? Forget about the burger. Just go for the lobster. 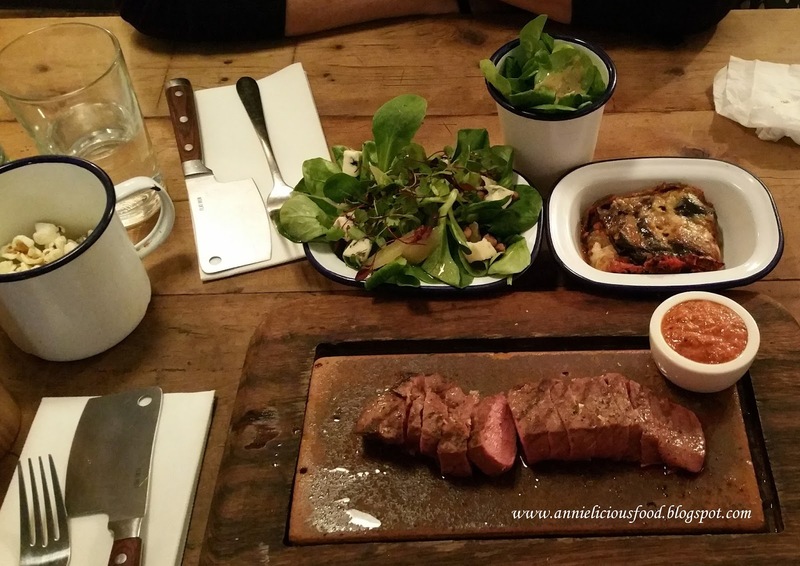 We visited Maze Grill during our first trip to London. I insisted that I wanted a nice steak and I wanted to visit Gordon Ramsay's restaurant. So, we picked Maze Grill at Mayfair, situated in the heart of the city. As the original Maze Grill, the Mayfair restaurant takes inspiration from the iconic Manhattan grill rooms to deliver rare breed steaks, fish and poultry. A nice modern grill fare with Asian influences. Maze Grill developed a reputation for its legendary sushi and sashimi too. But we forget about sushi and sashimi, we go straight to the steak. Our objective is steak. If you are a steak lover, like me, you will fall in love with this place. You have to trust me. We chosen rare breed selection Dry Aged 28 Days Sirloin £30, and also Rib Eye £34, cooked over charcoal in Jasper Grill. Operating Hours : (Mon - Sun) 6.45am - 10.30am for Breakfast, and 12pm - 11pm for Dinner. Never leave London without eating Fish and Chips. Crispy and comforting plate of traditional fish and chips is simply irresistible. Haddock and cod is popular here for good reason. Flaky and tender flesh beneath a perfect honey-colored batter. The fried chips too, chunky and yet crisp. Oh Yumm!!! 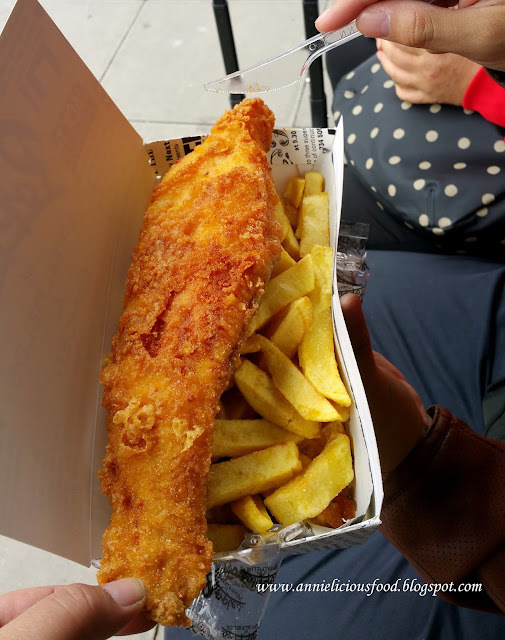 Here, I'm recommending you 3 fish and chips options in London that I went before. Fish and chips can be eaten either lunch or dinner or anytime during the mid-days. The Fish House is a place that brings treasures from the salty seas to the hustle and bustle of the big city. London is known for its love of fish and chips, and there is no better place to enjoy this simple delicacy than right here in London. The Fish House of Nottinghill is one of the Top 10 Fish and Chips in London. They serve really really good fish and chips and we simply cant's top eating it and we were mumbling "OMG! We can't get such good fish and chips quality in Singapore!" and we continue to stuff ourselves. Yeah. That's how good it is. Do take note that take away is cheaper than dining in. Never miss Poppies Fish and Chips if you were to visit Camden town. Very nice traditional fish and chips somewhere you might not expect to find it. The fish was excellent quality and the chips were very tasty. The service wasn't amazing during busy times, especially popular with tourists it seemed. We ordered a take-out, sitting right outside Poppies to enjoy our fish and chips. 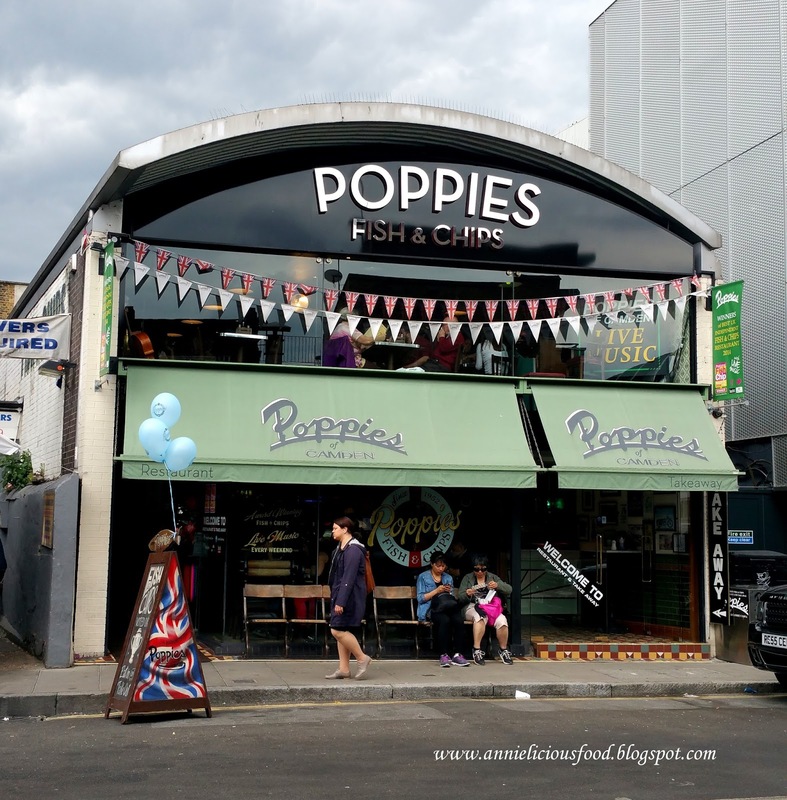 Poppies offers beyond staples of cod and haddock. The menu encompasses mackerel, seafood platters and jellied eels. But we still stick to our favorite cod. This is the first fish and chips we went in London and we absolutely love it. Step through from the small take away section into a simole dining room, fellow diners sit at functional tables that lend a canteen feel to the place. Food is of a high quality with no doubt. A wide range of fish cones either battered or grilled (generally pricier). Classic cod was generously sized and delivered quick-sharp from the fryer. We love the pickles. Really. This is absolutely an enjoyable meals with some old-school feel. We will be back for more if there's opportunity. 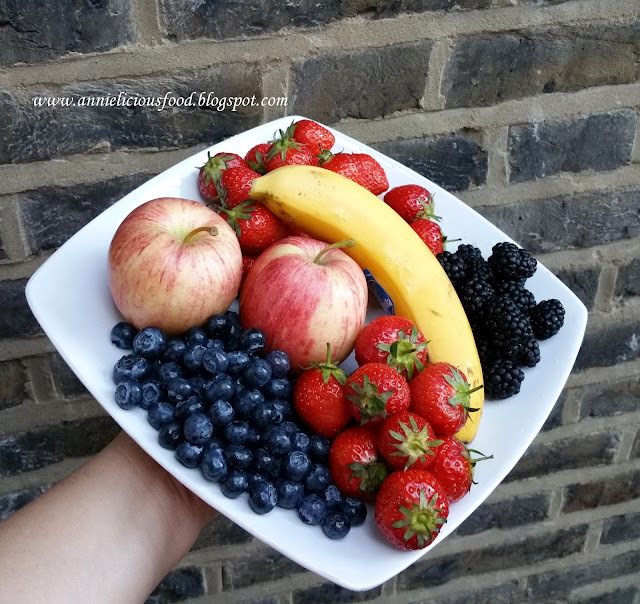 On a side note, when you are in UK, eat fruits. Loads of fruits! They are cheap, attractive varieties, and the pricing is absolutely affordable. I believe all of you would agree with me that eating berries in Singapore isn't cheap tho.